When a team is winning, morale is high and if morale is high, the team is in a position to win but what comes first? 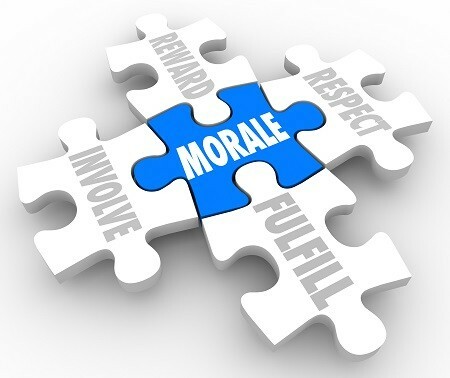 Is it “high morale or winning”? Most likely high morale, because high morale magnifies everything positive that is happening in the team. When an entire team is positive and all the players feel good about themselves, everything seems good. When a team possesses high morale, the performance of its people goes to an entire new level. The team focuses on its potential, not its problems. High morale gives team energy… players become like the energizer bunny! Because of the momentum and associated energy, everything but significant obstacles become irrelevant. Winning creates breathing space, to provide the freedom to try new ideas. Get the behaviours right, light the blue touch paper and watch the business come alive. When did you last reflect on the emotional temperature of your team?